Putin introduces journalists to his Japanese dog, Yume. Yume makes a few Japanese journalists nervous. Journalists from Nippon Television Network Corporation (Nippon TV) and Yomiuri Shimbun newspaper, who went to interview Russian President Vladimir Putin on Dec. 12 in Moscow, were greeted by a surprise guest. 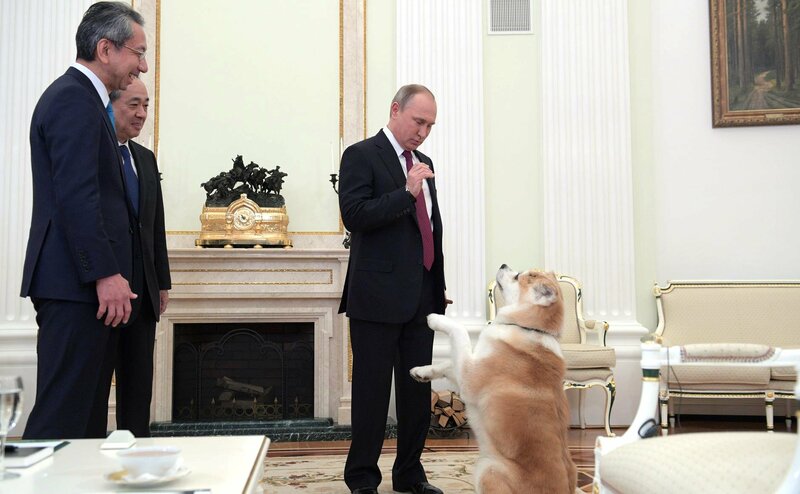 Yume, an Akita breed dog that was gifted to Putin in 2012 by the Japanese government, was present in the room. When a few journalists said they were scared of the dog, Putin replied that Yume was a “no-nonsense” dog. The Japanese government had planned to present the Russian President a male Akita as a companion to Yume during Putin’s upcoming summit with Shinzo Abe. But Russia apparently turned down the offer.